See the subscription as a "blueprint" for the future invoice: It combines the account information (buyer name, address, etc.) with the details of the products to be charged, like product name and description, price, price model, applicable discounts, etc. In this sense, subscriptions represent contracts or "billing plans". Cloning an existing subscription, copying the current configuration and any attached items and prices. JustOn also allows for building subscriptions automatically. For details, see Automatic Subscription Build. You can create subscriptions in different contexts, either directly via the Subscriptions tab or from any other page that includes a related list of subscriptions, for example, a detail page for an account or a contract. Depending on the creation context, the new subscription may automatically be connected to an account. This generates the new subscription, and you can proceed to add items (see Managing Subscription Items). Open the detail page of the account, contract, etc., in the context of which you want to create the subscription. Scroll to the Subscriptions list. The Subscriptions list must be made available in the corresponding detail view. For details, see Managing Pages. the account, invoice template, contact data etc. as copied from the original subscription. Upon cloning, you can modify this data as required. Open the subscription that you want to copy. Edit the details as necessary. This generates the new subscription, including the selected items and their prices. Open the subscription that you want to activate. Double-click the current status and select Active from the drop-down list. Alternatively, you can click Edit in the detail view and then select Active from the Status drop-down list. This activates the subscription, including it in the invoice run. Open the subscription for which you want to set a preferred invoice date. The subscription is considered in an invoice run if the invoice run end date is after the preferred invoice date. 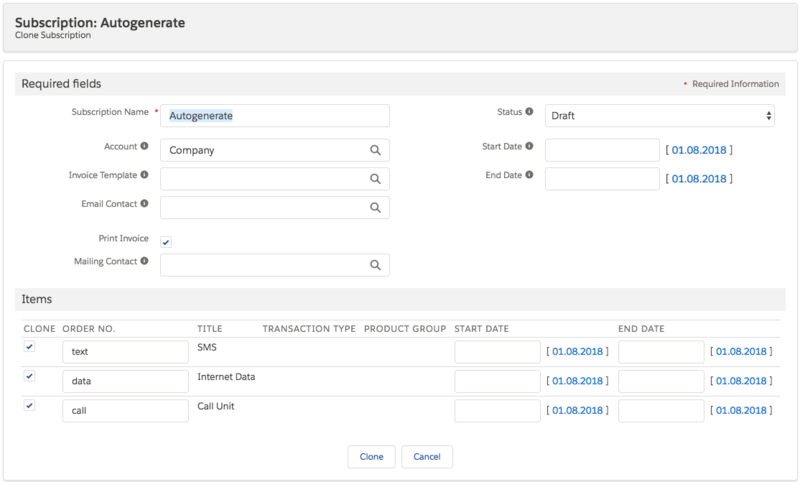 When finalizing the resulting invoice, the preferred invoice date is copied to the invoice as invoice date if the preferred invoice date is the current or a future date. The next preferred invoice date of the subscription is calculated by adding the billing period months to the last preferred invoice date. Auto-Renewal Defines the number of days or months to extend the subscription, setting up the subscription for automatic renewal. Cancellation Terms Defines the cancellation period in days or months for a subscription. If empty, a value of 0 is taken by default. End Date - Cancellation Terms + Grace Period. If the subscription has no end date, the field is empty. The grace period is controlled via the corresponding global setting. In Setup, open Custom Settings > Global Settings > Manage > Edit, and set a value for Grace Period. If left empty, 0 is used by default. Open the subscription that you want to be extended automatically. Specify the auto-renewal, cancellation terms and renewal date as necessary. This makes the subscription subject to automatic renewal. JustOn schedules the corresponding job to run daily in order to extend all auto-renewal subscriptions when the renewal date is reached. Renewal Date is set and less or equal to the current date. The automatic subscription update functionality is available as of JustOn 2.43. Certain business use cases require existing subscriptions or subscription items to be updated, for example, after the value of a source object field has changed. Make sure that the subscription update is enabled. For details, see Enabling Subscription and Subscription Items Update. Open the subscription that you want to be updated. Select the ON_UpdateSubscription checkbox, and click Save. As an alternative, you can set up a custom process to have the checkbox selected automatically when certain conditions are met. Execute the subscription builder as set up for the corresponding source object. For details, see Enabling Subscription Generation. This triggers the automatic subscription update. The subscription builder copies the specified fields to be updated. After completing the update, the subscription builder deselects the checkbox ON_UpdateSubscription and sets a date in ON_LastSubscriptionUpdate. Open the subscription for which you want to configure a price increase. Specify the price increase and price increase date as necessary. For the automatic price increase to become effective, there must be set up the corresponding scheduled job. This section shows a price increase example, illustrating its behavior. Certain business use cases require staged payment plans for invoices. To this end, JustOn allows for setting up installments, which represent models for intended payment plans. If this feature is enabled, you can define an installment type for a subscription. When executing an invoice run, JustOn consequently produces an invoice with the payment plan (installments) set up. Open the subscription for which you want to define installments. Double-click the Installment Type field and select the intended payment plan from the drop-down list. Alternatively, you can click Edit in the detail view and then select the payment plan from the Installment Type picklist. This activates the selected installment type, which triggers the generation of the corresponding payment plan when creating the invoice. Open the subscription that you want to cancel. Double-click the current status and select Canceled from the drop-down list. Alternatively, you can click Edit in the detail view and then select Canceled from the Status drop-down list. This sets the cancellation date to the current date. Double-click the Cancellation Date field and specify the date as required. Alternatively, you can click Edit in the detail view and then specify the cancellation date. This sets the status Canceled on the specified date. JustOn continues to process canceled subscriptions in the invoice run until their end date is reached. Canceled subscriptions without end date, however, are ignored. The subscription includes the field Initial MRR. It shows the sum of the initial MRR values of active recurring items at the subscription start. You can define additional fields on the subscription that summarize subscription metric data. Use this to calculate the current or future MRR values, like Current MRR or MRR in One Year. Last MRR Update Shows the date on which the MRR fields were last calculated. Current MRR Shows the current MRR over all recurring items. MRR in One Year Shows the MRR in one year, based on the last MRR update. The MRR fields are set up individually for your org by an administrator. Be aware that the field labels as well as the count/month configuration may vary. You can set the end date retroactively within one month to trigger the end metric creation. The individual subscription metric records are accessible via the corresponding related list on the subscription detail page if set up accordingly. Do not delete items from active subscriptions when using subscription metrics, as this would break the metrics. Instead, deactivate the item or set an end date, as described in Terminating Item. To actually create or update subscription metric records, your org requires the subscription metric builder job to be scheduled. The changes are always based on the previously tracked metrics. You can access the cash metrics records via the corresponding related list on the subscription if set up accordingly. To actually create or update cash metric records, your org requires the corresponding processes to be set up.